Though the economic and market headlines are full of interesting narratives, it is important to look past the superficial to understand the underlying fundamentals in order to get a sense for what we can expect beyond the day-to-day noise. While the headlines continuously change, economic and market fundamentals remain the driving force for global markets. As we navigate the road ahead we look to three likely characteristics to guide us. First, we expect the global economy to continue advancing as long as the underlying fundamentals remain strong. Overall, the indicators that we track suggest optimism for the global economy and risk assets, such as equities and commodities, so we think investors should maintain these exposures consistent with their overall plan. Secondly, we expect economic growth to slacken from its blistering pace at the end of 2017 as some of the recent positive economic reports are likely to come back down to normal levels. For example, the latest ISM Manufacturing Index reading of 60.8 suggests real U.S. GDP growth of approximately 4.0%. This growth rate is roughly double the sustainable rate estimated by the U.S. Federal Reserve (the Fed). 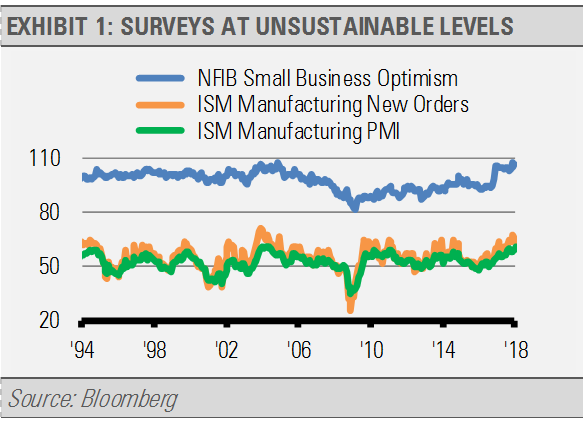 Furthermore, the ISM New Orders Index, which tends to lead business investment, and the NFIB Small Business Optimism Index are nearing all-time highs (exhibit 1). Based on history, both of those indicators are likely to fall back rather than remain at lofty levels for long periods of time. Broad economic growth is likely to soften globally, not just in the U.S. economy. 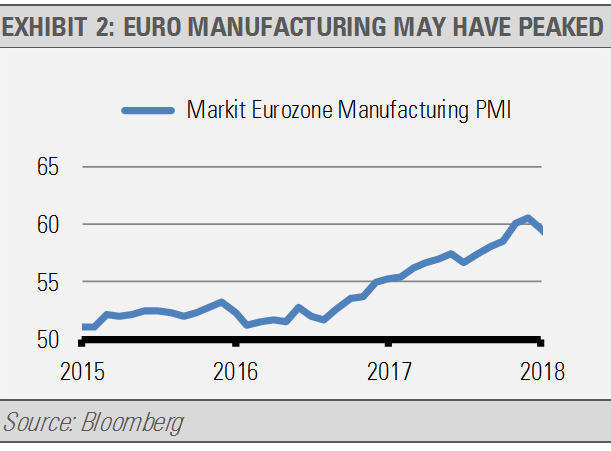 For instance, the recent Markit Eurozone Manufacturing PMI survey suggests the European manufacturing sector is performing at one of its fastest paces in over 20-years (exhibit 2). However, among the components in the survey, the growth of new orders, output and backlogs of work eased from prior readings. 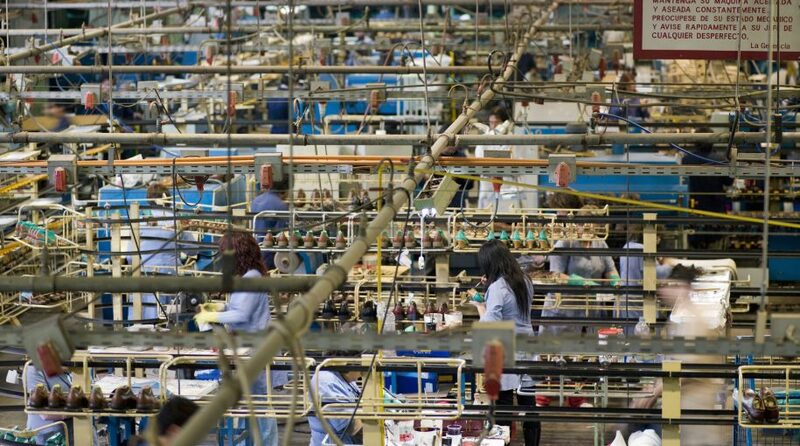 Additionally, factory output grew at its slowest percentage in four months. The rate of economic growth in China should soften as well. After years of encouraging debt-fueled investments domestically and overseas through its Go Out policy, China seems to be curtailing its reliance on debt and the risks associated with that type of economic growth. For example, they initially increased restrictions on the financial services sector and more recently nationalized the Anbang Insurance Group, which was struggling under a large debt burden and posed risks to their domestic customers. This suggests to us that China’s government is getting serious about protecting the country from a financial crisis and reducing their economic growth to a more sustainable rate. Finally, some of the side effects of economic deceleration are likely to be volatile stock and commodity markets with somewhat higher bond prices and lower long-term interest rates in the near-term.